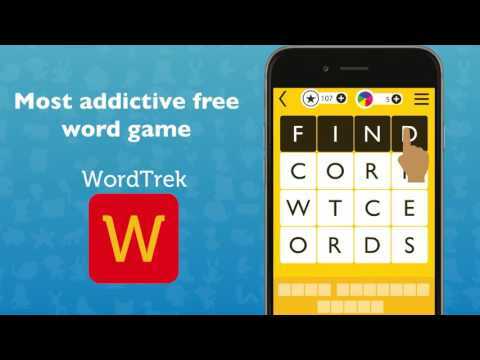 Word Trek - Word Brain streak: Hand-made puzzles, designed to tickle your brain cells! Are you a fan of word games and puzzle challenges? Try the most addictive free brain game on the Play Store and get hooked! Find and swipe your way through hundreds of word puzzles, spread across different difficulty levels and find out if you are a Word Genius and Master Puzzle Solver! Meant for casual brain exercise, join millions of puzzle solvers and trek your way to word glory! Start this intriguing word search journey as a tiny Amoeba and evolve into an Alien wordsmith! And then, solve your way across the universe, clearing puzzles on different planets! Stuck with a Puzzle? Don’t worry, all grids are double-checked to make sure they are solvable! Just keep trying, or use a few hints to reveal some letters! Connect to Facebook! Invite friends, earn coins for each referral, send more coin requests, and use them to get more hints! Also, get to see who has a better way with words! + A lot of Challenging Puzzles! + Cool Alien Mystery Adventure! + Applicable to Any Ages! + Applies to All Android Devices or Google Play Users! + Any time at Any Place, Play Offline! + Themed Puzzles during Holidays! As a bonus, train your brain with the Daily Quest feature! Brand new puzzles every day with cool rewards! Download the most popular word search and puzzle game now, and play for free! Note: Use of this application requires you to grant it permission to access the external storage for downloading daily puzzle content.